Before we get into this, let's do a quick recap of the first half of season 2. First of all, the show dealt with Phil Coulson trying to transform into his new position of S.H.I.E.L.D. director, especially in a world where S.H.I.E.L.D. is a terrorist organization and HYDRA is beginning to develop a strong foothold in the world. 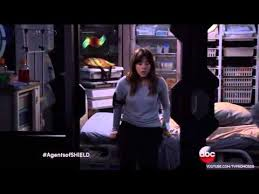 Another story this season explored was the truth about Skye, Chloe Bennet's character. We learned her real name is Daisy, and that her father, played by Kyle MacLachlan is Calvin Zabo. If you know the comics, you know what that means, if you don't there was a supervillain called Mister Hyde, who gained his powers in a way in which it sounds. He had a daughter, who became a S.H.I.E.L.D. agent, and it seems they are creating that for the show. There was an alien artifact that HYDRA really wanted, which S.H.I.E.L.D. got and it turned Skye into something...superhuman. When season 2 started back up again, we learn that Skye/Daisy was quarantined. Not because they are afraid of her, Coulson and his team have no idea what Skye did and only Leo Fitz (Ian De Caestecker) knows Skye's secret and they are going to keep it a secret because they are afraid to endanger or frighten the rest of the team. In the comics, Daisy became a character called Quake, and she is slowly showing off her earthquake-like powers. She has no idea how to control them and she is afraid of the day when the rest of the team figures out what happened to her. That was a big part of tonight's show, that and a bunch of HYDRA management got killed tonight, and it was pretty epic to watch S.H.I.E.L.D. put the beat-down on these bad guys! When the mid-season finale ended, we got a small glimpse of a guy with no eyes and we learned that he had another oblisk, the artifact both S.H.I.E.L.D. and HYDRA were after in the first half of season 2. When tonight's episode began, we learn a small origin of the guy with no eyes, who goes by the name Gordon. I am still not familiar with this character, but apparently he is a character from the comics and he is tied to the Inhumans. The terrigen mist released from the oblisk gave Skye her powers, and the terrigen mist is also related to the Inhumans as well. So the show is being used as an introduction to the Inhumans, which is cool since we have to wait a little longer to see the movie since Marvel got Spider-Man back. We learn that Gordon was somehow connected Calvin Zabo's wife. I wonder what this could possibly lead to, and I am very intrigued. One thing that bothered me about tonight's episode is a sneaking suspicion I got near the end of the episode. It seems there is something going on between Bobbi (Adrienne Palicki) and Mack (Henry Simmons). It seems they are spying on Coulson and they are connected to somebody else. I am afraid that somebody else might by HYRDRA, I hope not, but I think so. This angers me. First of all, they already did the whole traitor thing last season, and one thing that really hurts shows in the long run is circular plots, we don't need a new traitor every season. Second of all, I really like Palicki and Simmons and I love their characters. I don't want them to be bad. If this is leading to something unsuspected, then I'll be excited, but if they end up being HYDRA, I feel that will hurt the show. Oh and Raina is something else now, as she passed through the mist with Skye. Whoa. What did you guys think? Overall, this was a strong return. I can't wait to see what happens next week.